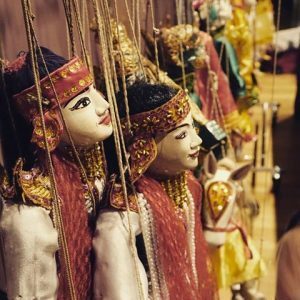 Once upon a time, marionette shows were very popular among Burmese people, and highly esteemed by the royal court. No pagoda festival in Myanmar was complete without a marionette show. But, nowadays, the old Myanmar marionette tradition has already started to fade away. Actually, wooden puppets manipulated with strings by puppeteers perform traditional Myanmar marionette shows. 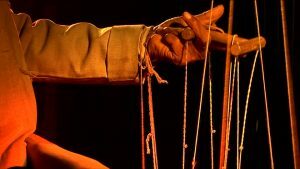 The handling of strings which makes the marionette dancing is quite difficult and needs long term practice and skills. When the puppeteers master their act, the marionettes could dance attractively in a subtle choreography. The dancing act and performance is supported by music and song played by a traditional orchestra behind or below the stage. 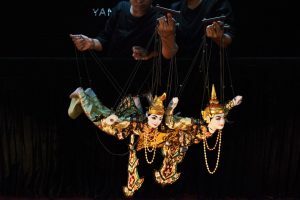 Therefore, a marionette show contains many artistic features like traditional dancing; classical Burmese music and even the art of woodcarving and painting to make beautiful puppets. That is mostly why it has become one of the most characteristic arts in Myanmar. 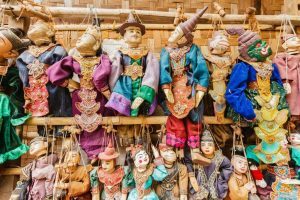 Myanmar marionette tradition is old from many centuries, it was well established already during the Bagan Era, around the 11th century. But it became very demanded and popular during the Kone Bong Era (1820-1885). 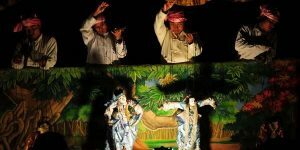 At these times, Burmese Kings did not allow human dancers on the stage because they did not want anybody standing higher than them; puppeteers only were allowed. This is why the small lifeless puppets became heroes. The stage at that time was known as Ah-Myint-Tha-Pin (အျမင့္သဘင္), which literally means “performing on the high stage”, human manipulators and singers were hidden behind the back curtain. Another interesting point is about the puppet sculptors. They had to create the small and beautiful marionettes according to very strict rules. For example, in order to create and carve particular figures, they had to use only a specific kind of wood, which was suitable according to the ancient wisdom. Moreover, the prescribed proportion of the figures had to follow in details the proportions of the actual human anatomy. Among the marionettes, Zaw-gyi was considered as the most difficult to create and manipulating Zaw-gyi was usually let to the best puppet masters, as it was very complicated. Even the storage of marionettes have to follow a traditional rule. The senior or higher ones such as the King, the Prince, the Princess, Hermit, etc. are kept in a separate box, known as Right Chest while the lesser ones, like animal marionettes are kept in another smaller box, the Left Chest. Furthermore, there are rules and regulations for entrances and exits of each marionette. For instance, Zaw-gyi who is supposed to have supernatural powers enter the stage ‘flying’ and exit in the same way. As for the animals, the elephant puppet has to enter the stage from the right side, and the tiger puppet from the left side. Ritual dancers: 2; Horse: 1; Elephants: 2; Tiger 1; Monkey 1; Parakeet 1; Dragon 1; Ogres 2; Zawgyi 1; Ministers 4; King 1; Prince 1; Princess 1; Elder prince 2; Brahman 1; Hermit 1; Celestials 2; Old woman 1; Clowns 2. Nowadays, marionette theaters cannot be seen everywhere around Myanmar unfortunately. But, if you will go and visit Mandalay, there are still some famous theaters which usually perform every night, such as Htwe Oo Myanmar Marionette show. They present their show based on plots and stories so that everybody, especially foreigners, can easily understand. Though marionettes shows are not that popular anymore, this art will live in the heart of the Myanmar people forever.